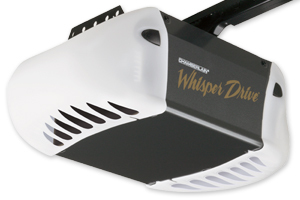 The Chamberlain Whisper Drive 1/2 HP Belt Drive garage door opener is the ultimate in quiet performance. It features our exclusive Motor Vibration Isolation System (MVIS), which eliminates powerhead vibration for reduced noise, making it the ideal choice if you have rooms positioned above the garage. And the 1/2 HP heavy-duty motor offers steady performance and lifting power year after year. The Protector System safety sensors with Rapid-Snap brackets project an invisible light beam across the garage door opening and automatically reverse the door if anything interrupts the beam while the door is going down. The sensing technology will stop the door from closing if contact is made with a person or object. The opener lights turn on automatically when the Protector System's infrared beam is broken. The Security+ anti-burglary technology assures a new code is sent every time the remote control is used. PosiLock theft protection assures that once the door is closed, it says locked. Use the manual release handle in case of power failure. Terrible machine after 1 and a half years. Stupid design. I have had this machine for a year and a half. The stupid thing was supposed to have a long warranty on the belt and parts. I started noticing it was closing and going back up. I thought it was the misaligned beams, but it was not. I noticed a black ring on the ground and did not know where it came from. Later the stupid thing would choke on itself. Come to find out after it would not close anymore the wheel that belt turned at the garage side broke. The stupid thing was made of plastic and the belt ate away at the bottom rim, so that was where the ring came from. It had chaffed away the bottom of the plastic wheel. My question is, what numbnutt would design a garage door opener with a part that obviously faces the most stress from cheap plastic? The piece is so cheap, you could swear it belongs in your kids toy box. It chaffed away and the belt got chewed. Could they have spent an extra 3 bucks to have made it from aluminum, if that? The motor works fine, but the design is stupid and does not last. I had a contractor install it. I will never buy a belt driven garage door anymore. Who cares if it is quiet, you can still hear it opening from inside the house. Do not buy till they replace the plastic pully wheel on the other end of the garage door opener. I know a lot of people just bought it, but I have owned it for a year and a half. The customer service person was nice and sent me a new part, but a week later that one broke. I used this product to replace an aging chain-drive LiftMaster. Installation was fairly straightforward; it took me about 8 hours total to install (including coffee breaks) and that included some minor adjustments and clean-up (I'm your average Joe - not especially stupid but not an expert in garage door openers either). Because I was replacing an existing door opener I was able to re-use the header bracket supports and (eventually....) the control unit support brackets too. As noted by a previous reviewer, if you're installing from scratch, some of the fasteners needed for installing your own header bracket support and the control unit support brackets are not included in the box - you should plan accordingly and install these items first before attempting the opener install process. The provided installation document is lengthy but has very clear instructions and excellent diagrams. Once installed, I found most of the factory settings to be exactly what I needed - mine needed very little adjustment in terms of up/down force or travel distance. The unit is very quiet - MUCH quieter than the chain-drive opener it replaced. The safety sensor clamps provided are a breeze compared to older kits I've had to use and they made sensor aligment trivially simple. Everything worked right out of the box - fit and finish of the various components is excellent, a high-quality product. The unit comes complete with two wireless remotes for use in your car(s), a wired switch for operation from inside your garage and a battery-operated wireless keypad device to enter a four digit number sequence. The last device I actually installed inside my home (as I have a detached garage and it made sense for me to do so) - however, it's typically installed directly outside the garage entrance. All of these devices worked perfectly right out of the box. Although the product per se worked exactly as advertised, I did have some follow-on problems. I own three cars - all of them equipped with HomeLink (the universal garage door opener technology). Previously, each vehicle's HomeLink button was programmed to operate my old LiftMaster and they all worked fine. However, after reprogramming them all to learn the new WhisperDrive's code - none of them worked. I called Chamberlain tech support but they told me flatly that they wouldn't work on any HomeLink issues (even though this product is advertised as being HomeLink-compatible). Instead, they referred me to Homelink for support - which I found a bit annoying. However, the Homelink support line was great and diagnosed my issue in about two minutes: on this model garage door opener, it's not enough to reprogram the Homelink button in each vehicle. You must also subsequently press the "Learn" button on the WhisperDrive's control unit and within 30 seconds press your reprogrammed Homelink button in your car, so that the WhisperDrive can learn that vehicle's new signal. When it has done so successfully it will blink both control unit lights. Repeat this process for each car. I'd consider this issue to be a Chamberlain problem (it's not documented in the install guide) and not a Homelink problem. Chamberlain's tech support should have been able to handle this one but instead played the finger-pointing game. However, that's a very small nit in what was otherwise a very pleasant(and unexpectedly uneventful) installation experience and a very satisfactory end result. A very good product - buy it with confidence. This garage door is slow. That is good. My garage door was installed in 1975 and is very heavy. I also really like its lack of racket and the 200 watt light. The door was not difficult to install. My Genie "Accelerator" was very noisy and hard on my garage door because it opened so fast. I was almost relieved when the motor circuit board pooped out. The door was only about five years old and I was unable to purchase any parts for it! This is an amazing unit/package. It is SO quiet...you literally hear nothing but the door creaking and a very slight motor noise, very slight. It's also quite nice looking, very sleek styling. Comes w/two compact three-button remotes already tuned to the door, and a keyless entry pad for access to the garage w/out a remote. My wife also picked up another gizmo you can plug a light into inside the house to control w/the garage remote as well. The motor unit takes two light bulbs, up to 100 watts! This sucker really lights it up! Did I say it is quiet! I mean really quiet! This opener is a significant step forward in this business. It is indeed very quiet due to belt and spring buffer, a small and cheap addition, almost eliminate ugly buckling. Sectional rail is a great innovation. It makes shipping easy and cheap and provides installation flexibility. Wide range of accessories is also something that everybody would like. And all this is achieved for a very moderate price. A fixed length of the belt is the only disadvantage. There must've been different lengths of belt available so that an installer could choose from for different number of sections or there must've been a kit provided that allows to change belt length according to number of sections used. I heard to stay away from the chain drives especially because the motor would be directly under my office. So I bought a whisper (belt driven). It is very quiet. My garage door rollers are basically the only thing you can hear. I installed it myself in no time. 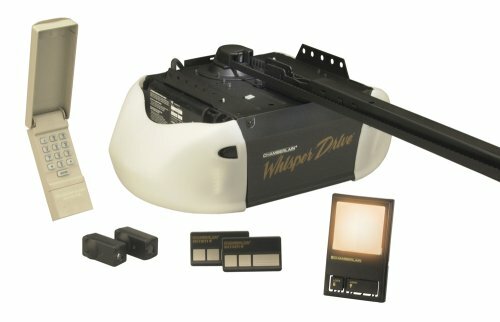 I would/will recomend the whisper drive to any one in the market.